The centre stone marks the official centre of Cheltenham. Travelling distances were measured from this point. Later, fares for cabs and taxis were calculated from here. The words were on an earlier 19th archway to the market. When this was demolished they were transferred to the nearest house, now the jeweller’s F Hinds. High up on the wall of F Hinds the jewellers, at the corner of High Street and Bennington Street, is an intriguing sign that reads ‘Centre Stone’. Exactly when it was put there is unknown. A photograph of the 1822-3 Moghul Indian style entrance to the Market Arcade, probably taken shortly before its demolition in 1867, shows those same words above the centre archway. When these were added and whether there was an actual stone is unknown. The only known print of the entrance (published 1826) doesn’t show those words. 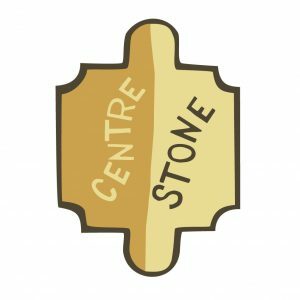 The first reference to ‘Centre Stone’ in local newspapers was in February 1836, when it was noted as the point for measuring all distances within Cheltenham (including cab fares). In 1841, when the Town Commissioners set up several iron milestones in the town (two of which still survive – one in situ in Bath Road and the other (formerly in Old Bath Road) now at The Wilson), the given mile was to the Market House, which was clearly regarded as the town’s central point. The Arcade faced the High Street, behind it was an arcade of small shops. In 1837, J. Herbert’s Boot & Shoe Manufactory occupied Nos 1 & 2 Arcade which was advertised in the newspapers as ‘At the sign of the Golden Boot, above the Centre Stone’. Perhaps suggesting that there was an actual stone in the roadway? Sadly, we shall probably never know….and it is more likely that the reference was merely to the stone that formed the entrance. Sometime after 1867, the site of the former Arcade (by then represented by Bennington Street) was narrowed and a new building (now the jewellers) was built to the west of the existing No 148 High Street – and onto which the words ‘Centre Stone’ were placed.